A classic variety that will give you masses of rich red blooms. A vigorous grower that does well even into the deep South. Planted in Loveland, CO, difficult soil (lots of wet clay). When I got Rosie, the foliage was so delicate, I thought for sure she would not make it. Wrong! She is vigorous despite her look, and she bloomed and spread in year one, and is again doing great in year two! 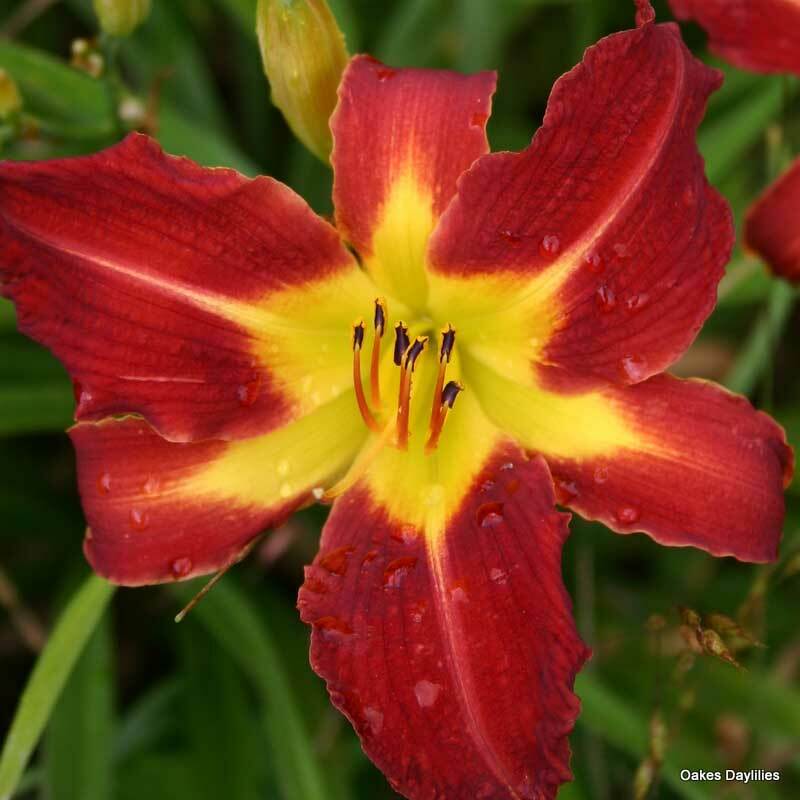 This is a tough daylily that looks and performs great! 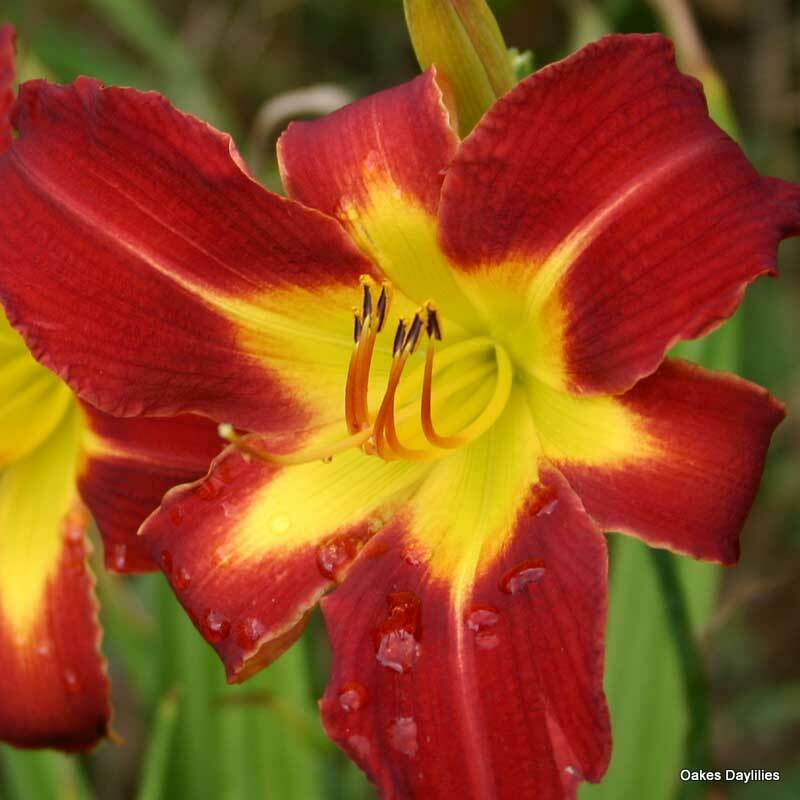 Rosie Meyer was the first Daylily I planted in my garden, she is an early bloomer that is very hardy. Her scapes get very long(36″) with at Ieast six blooms per scape. She is also a reliable re-bloomer, I get three flushes most years. Rosie Meyer bloomed all summer long in 2015. There was not one day that we did not have at least 2 or 3 blooms. At one time we had up to 14 blooms. 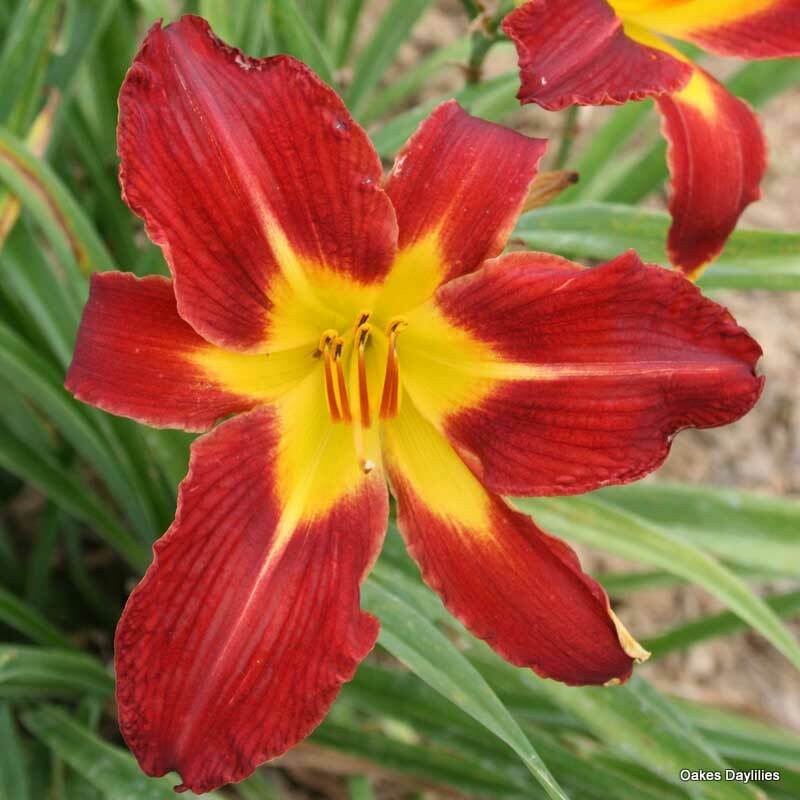 I think they are one of the most colorful and prolific blooming Daylilies you can buy. Highly recommended. Rosie Meyer is so impressive! So graceful and such a lovely bright red & yellow. And so many blooms! One of my favorites. Plus it’s a rebloomer! Palmdale, Ca. We planted them on a backyard berm probably 7-8 years ago. It took a couple of years for the first blooms, but ever since they have been great. Very prolific large flowers. Love the bright colors. I have my Rosie’s in the middle of a huge daylily bed and good thing too. It’s huge, very tall! The blooms are quite large and hold their color throughout even the hottest East Tennessee summer day. Prolific bloomer. This one looks great anywhere but remember, it’s very tall. A TRULY BEAUTIFUL BLOOMER. FIRST YEAR AND MANY, MANY BLOOMS. JUST LOVE IT’S STAND OUT COLORS. This is just the second season for Rosie in my garden and I was very pleased with her display earlier in the season. Imagine my surprise a few days ago when I noticed a tall scape with many developing buds on it. Since then she has opened 2 gorgeous blooms with probably 10 more buds still maturing. Here it is September and it looks like I’m going to enjoy her beauty for another couple of weeks. This one took awhile to establish and bloom, but when it did bloom–WOW! The color is so bright! I had to move it to another spot in the garden because it definately cannot be planted with anything other than yellow. I planted Rosie Meyer in May, 2008 and was pleased with it the first year. In the Spring of 2009 it bloomed from March – late June, and then rebloomed from September through Thanksgiving! We had a total of 63 blooms on the rebloom – more than we had in the Spring. We were delighted – this is a “must have” for lovely flowers that just keep blooming! 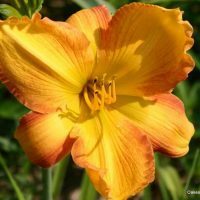 I was skeptical about planting an evergreen daylily in zone 5, but liked the flowers so I ordered some during the summer of 2008. What a surprise! 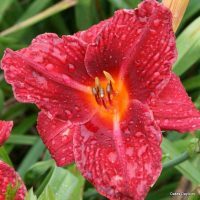 I planted Rosie Meyer in the middle of a hot Midwest summer, and before fall, I had lovely red blooms with a contrasting golden throat. And surprise again – they’re back this spring with a nice increase in size. These plants are inexpensive, hardy in zone 5, quick to increase, and although not a fancy flower form, offer a nice red/gold contrast bloom. 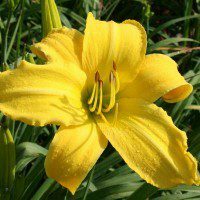 A good, basic daylily for anyone’s garden. This is the second year for Rosie Meyer in my garden,this daylily is a very vigorous grower and is loaded with blooms. The color is beautiful and bright, I highly recommend this plant to anyone with hot,humid summers. Rosie Meyer is a real favorite in my garden because she starts to bloom in April. Beautiful color and vigorous grower.